Waste management company, ZL Global Alliance (Nigeria) limited has emerged Africa’s best world class quality waste management services company of the year 2018. ZL Global Alliance engages in integrated waste management, waste containerization, revenue collection system, dumpsite and landfill management, recclying and material recovery and distilling of drainage and rivers. The award was presented to the company alongside others who have distinguished themselves in their respective fields by World Quality Alliance. Other organizations who also bagged same award in other categories include, Nigeria Security, Minting and Printing plc (NSMP), Lagos water corporation, Premier seed Nigeria limited, Africa global medicare, Agrited among several others. The event, which took place at the Nicon luxury hotel Abuja was part of the activities that marked the World summit and Africa quality order of merit award 2018. Speaking on the award, the Country Director, World Quality Alliance, Esorougwe Desmond said, ZL global alliance emerged winner of the award among several others in the waste management category based on innovation the company brought into waste management in Nigeria. “The award is about innovation they have added to the organisation because overtime, waste management in Nigeria has been a kind of business for some people. But ZL Global Alliance is remodelling waste management and this is what won them the award. It is to encourage them. “The award did not just come to them. It came after a lot of research on companies that are into waste management in Nigeria and ZL Global Alliance emerge the number one”, he added. 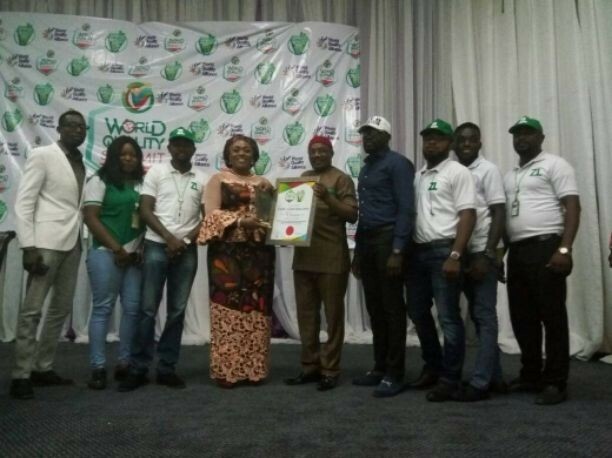 In her acceptance remark, the managing director and Chief executive officer of ZL global Alliance Dr. Abiola Bashorun aporeciated God and her team who have made it possible for the company to achieve such fit saying, the award would spur her to improve on quality and effective service delivery in waste management. She said, “I am grateful to God because the award came as a surprise. That we are recognised in the whole of Africa as the best is amazing. “With this award, I feel honoured and see that hard work pays, recognised for delivering on set goals amidst all the challenges is indeed quite encouraging. “Apart from what we have learnt here today and what we are learning on the job, we are going to improve on our service delivery, turn around time and then we are going to wrap up with training and retraining of our people because they are the most important resource we have” she stressed. ZL global alliance is currently engaged in waste management by Kaduna and Ondo states government among others.